If you’re a fan of tequila, you probably know that most aged tequilas use former whiskey barrels for maturation. And since barrels aging bourbon and rye produced in the US can only be used once for maturation, these whiskey barrels are sold to mature other spirits such as Scotch whisky, rum, and tequila. But what would happen if the barrels you used to age your tequila previously held highly regarded and coveted whiskeys? Like say from the Buffalo Trace Distillery? Well that is what Corazón Tequila has done with their Expresiones del Corazón collection. If you’re an American whiskey fan, names such as George T. Stagg and Sazerac Rye get the blood pumping. Rarely, if ever, do you know which whiskey barrels your tequilas were aged in, let alone with whiskey stock of this nature. These special tequilas debuted in June 2018 nationwide in limited quantities. 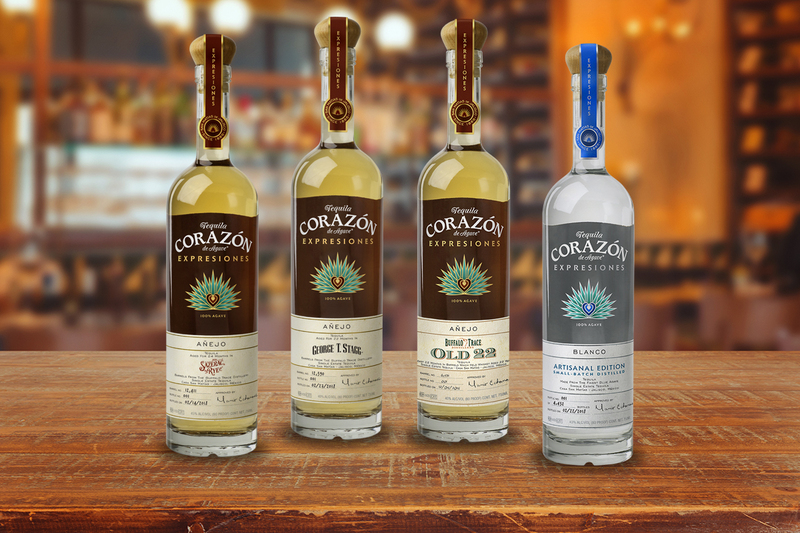 Corazón Tequila, a brand owned by Sazerac, parent company for Buffalo Trace Distillery produced all the tequilas below. The brand distills their tequilas at the Casa San Matías Distillery in Los Altos of Jalisco, Mexico — one of the oldest tequila distilleries in Mexico with over 130 years of experience. This 2018 collection marks the fourth such release of tequilas with the first collection debuting in 2013. This 100% agave blanco tequila forms the base used for the Expresiones del Corazón collection of barrel-aged tequilas. First, the brix level is checked to determine sugar content in the agaves prior to harvest with both higher and lower sugar content agaves used here. After distillation, the tequila rests in stainless steel tanks for 60 days prior to bottling (or in the case of the tequilas below, placed in whiskey barrels for maturation). Bottled at 80 proof. Suggested retail price $59.99. This añejo tequila aged at least 22 months in Buffalo Trace Distillery bourbon barrels which held whiskey for at least 22 years. Now you can see where Old 22 got its name. Bottled at 80 proof. Suggested retail price $79.99. George T. Stagg Bourbon, known for its staggeringly high proof and uncut nature, results in quite the bang for the buck. Keep that in mind when trying this tequila which aged at least 22 months in former George T. Stagg Bourbon barrels. Bottled at 80 proof. Suggested retail price $79.99. This añejo tequila used former Sazerac Rye barrels for its maturation. Aged for 24 months and bottled at 90 proof. Suggested retail price $79.99. Ready to dive into the 2018 Expresiones del Corazón Collection?